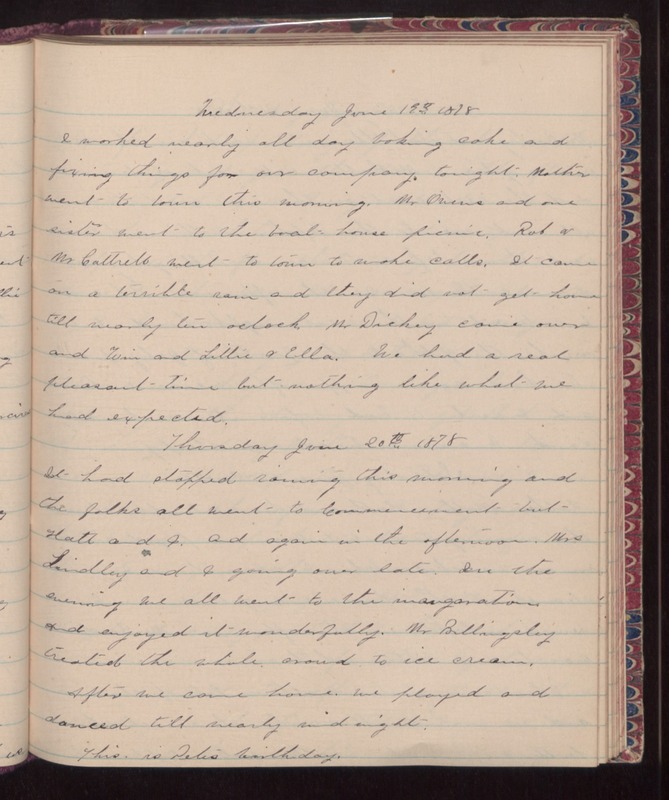 Wednesday June 19th 1878 I worked nearly all day baking cake and fixing things for our company tonight. Mother went to town this morning. Mr Owens and one sister went to the boat-house picnic. Rob & Mr Cattrell went to town to make calls. it came on a terrible rain and they did not get home till nearly ten oclock. Mr Dickey came over and Win and Lillie & Ella. We had a real pleasant time but nothing like what we had expected. Thursday June 20th 1878 It had stopped raining this morning and the folks all went to Commencement but Hatt and I. And again in the afternoon. Mrs Lindley and I going over late. In the evening we all went to the inaugaration and enjoyed it wonderfully. Mr Billingsley treated the whole around to ice cream. After we came home we played and danced till nearly midnight. This is Pete's birthday.